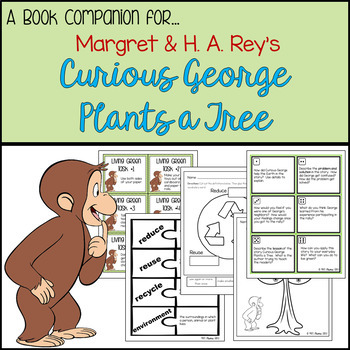 All of the activities in this download are designed to compliment the story Margret & H. A. Rey's Curious George Plants a Tree. Perfect for Earth Day, Arbor Day, and spring time! 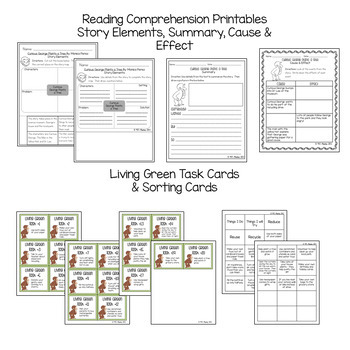 Printables review story structure, summary, and cause & effect. Human Sort: Discuss the definition of reduce, reuse and recycle. Have students consider which definition their task represents. Work together to sort the class into 3 categories: reduce, reuse and recycle. Have students physically move into the correct category and share. Living Green Task Challenge: Give each student a task card or have them choose. Challenge them to try their Living Green Task for a day or so then report back to the class about how it went. Was it difficult? Why or why not? How did you help the environment? Would you encourage someone else to do this? Why or why not? Students can sort two different ways. The categories provided are Things I Do and Things I Can Try. This allows students to explore how they can “live green.” More categories provided in the sort are Reduce, Reuse, and Recycle. Students can determine which task represents which definition and sort them accordingly. 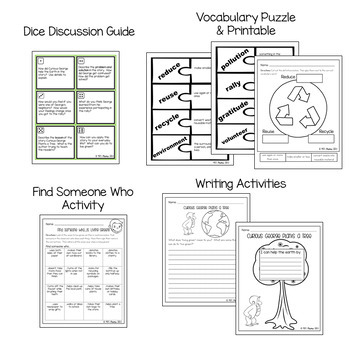 Have students roll a die and discuss the questions provided on the discussion board. Partner find: Give each student one piece of the puzzles (duplicate, if needed). Have students think about their word or definition and what its match could be. Then have students walk around the classroom until they identify the person who has their matching piece. Partner/Group Work: Give students a set of vocabulary puzzle pieces already cut. Have them work together to discuss the definitions and match them to each vocabulary word. Find Someone Who Activity - students find other students in the classroom who regularly practice different ways of "living green" and record their names in the table. Living Green Writing Prompt- Students explain ways they can "live green." You may also be interested in other Curious George Book Companions! Or more Earth Day resources! Thank you for looking!!! Enjoy! !